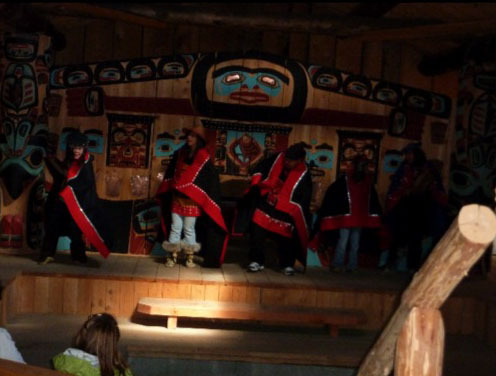 The oral tradition of the Chilkat people is carried forth in our tours with our local guides sharing the story of Kaaya Haayi Hit—the building of the camp’s “All Nation” clan house and, if time, the Klukwan Founding Fathers’ story. Your senses will be delighted when you enter the camp clan house and hear the singing, drumming, see the beautiful carvings and old time construction methods and the beautiful regalia of the dancers with the scent of nearby camp fires and smokehouses wafting on the breeze. The dancers carry on the tradition of their ancestors and are happy to share the cultural context of their songs and dances.